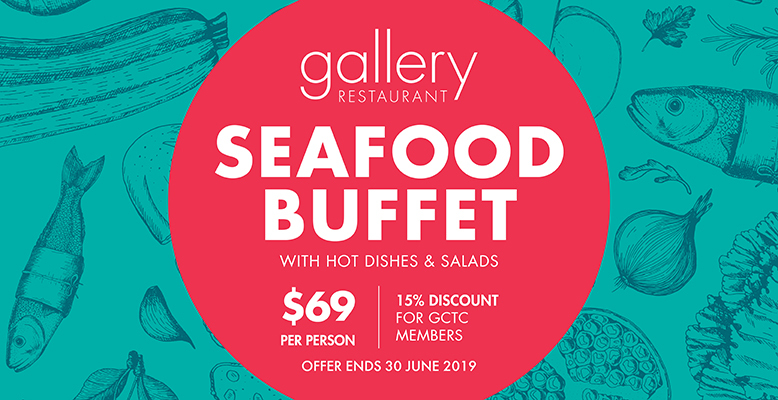 Offering special event venues on the Gold Coast, GCTC opens up a spectacular seafood buffet in the Gallery Restaurant. Gallery Restaurant is a must for all seafood lovers with its vast selection of ocean riches including fresh Queensland Tiger Prawns, Smoked Atlantic Salmon, freshly shucked Oysters and steamed Barramundi. We also have a selection of amazing foods for land lovers including antipasto, succulent roasts, internationally inspired dishes, seasonal vegetables and artisan breads. Finish with Choux Pastry and Petite Fours, Seasonal Fruit Platter and Australian Cheeses with Lavoush. A wonderful day, we will be back! Cannot fault today’s dining, food was delicious, staff were friendly & attentive. Good to see leafy greens. The service was outstanding. All day it was first class. Friendly staff and prompt service! Great staff and service thanks! Great table and lovely birthday celebration! Had a wonderful day with exceptional service! Amazing! Had an absolute ball for my hens party! Zoe did a wonderful job – very professional, helpful and efficient well done. Thanks – great day! Seafood was outstanding – very fresh! Very good staff. Our first visit and staff were very helpful! Bev our waitress was very attentive and looks after us! The staff very responsive to customer needs. My husband and I had a great day out – thank you! Most enjoyable day – Gallery staff excellent! The vegan meals were delicious! Thank you for the effort – it is appreciated. We absolutely lovely the friendly staff. Isabelle & Courtney go above and beyond to make a great day out. We have spent many days trackside. The experience here was as good as we have had at major metropolitan tracks. Everyone was very pleasant and made our day. Loved the birthday surprise, thank you – great day out!! Amazing value for money. Great food in a great venue! Great service (with a smile) from Zoe who took over from Luke who was also good. Thank you very much for the great service. Daphne our hostess was friendly and helpful. The atmosphere great a definite memorable occasion. Delightful and friendly waitress! Selection of food was excellent – great day! We had a fabulous Christmas lunch! Staff were extremely friendly, very welcoming and service was exceptional. Our serving staff was above excellent! Bev was the most wonderful hostess! Great value. Excellent trackside location. Good service, especially drinks & clean up. Excellent day out with family! Maddi really looked after us. She was fantastic and really made our day enjoyable! Service by Matthew was outstanding! Fantastic Day – great food & service! From USA been here for 5 races – had a wonderful time! The ladies who looked after us were first class! Very attentive service always happy to look after us! Great buffet selection excellent service by Matthew! Maddi & Matthew were amazing! Oysters were beautiful, all food excellent! Maddi gave us excellent service we were so impressed by her. And the food was amazing! Very friendly & sweet all the staff were open and communicated well! Maddi was outstanding! Provided brilliant service. Thank you so much for the birthday cake and song! Very much appreciated – the service overall made our day. Staff excellent and very helpful! Maddie was fantastic great sense of humor!